Corporate bylaws are an Illinois corporation’s formal blueprint for how it will operate and must be adopted the shareholders at incorporation. The corporate bylaws, among other things, provision for the rights and powers of a corporation’s directors, shareholders, and officers. Corporate bylaws vary in length and detail but must, at a minimum, contain certain standard, common provisions as required by statute. Rules on how contracts, loans, checks, and stock certificates are to be approved. Corporate bylaws are a corporation’s operational blueprint which reflect, among other things, the rights and powers of a corporation’s directors, shareholders, and officers and sets up dispute resolution mechanisms. In sum, bylaws establish the structure of a corporation and should to be customized for the individual corporation’s specific situation and needs. In addition to establishing directors’, shareholders’, and officers’ powers, bylaws also establish how those corporate officers and/or directors in charge are nominated or elected, as well as set up how disputes among parties will be resolved. 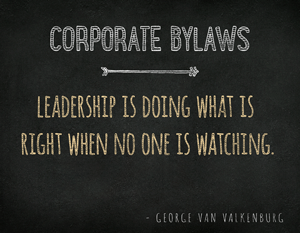 Additionally, it is important for corporate bylaws to include a Conflict of Interest Provision. This provision protects the corporation from Internal Revenue Service (IRS) penalties, which may occur if the IRS finds the corporation is providing unfair benefits to directors, members, or others. Finally, corporate bylaws ought to include provisions on how to amend the bylaws, what the process will be, and when amendments may occur.